I recently found out about a startup called Hsoub founded by group of students studying in the United Kingdom. It is an internet-advertising solution that focuses on the Middle East and North Africa, aiming to connect advertisers with publishers from the MENA. 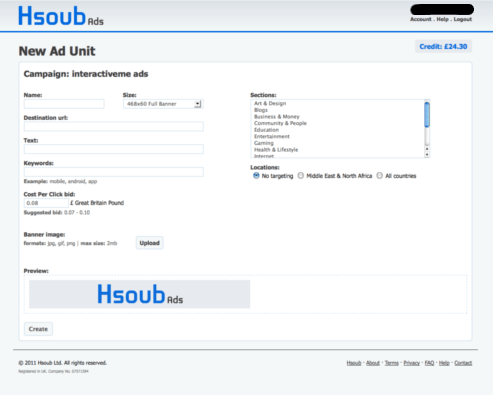 Hsoub Ads works in similar way to Google Adsense and is very simple to use with a clean user interface, it is built to help businesses to enter the MENA market by advertising in high-quality websites, at cheaper price than Ad agencies, and generating good revenue for bloggers and publishers in MENA. So the main selling point for Hsoub is quality in targeting rather than quantity. Abedalmohimen Alagha: CEO – is a 21 year old from Syrian, who describes himself as an ethical hacker with security, programming and web development backgrounds. He previsouly founded iSecur1ty – an Arabic community for security professionals in 2009 which is now one of the top security websites in Arabic. He also worked on developing free and open source projects at SecurityTargets. Ibrahim Uzar: COO – is a 19 year old from Turkey, who lived in Saudi Arabia. Studying advanced maths and computer science, Abdelmohimen describes Ibrahim as a very ambitious and promising person. High-quality. We only approve websites that are publishing good and original content, and we review the website content before adding it to Hsoub Ads publishers network. Simplicity. From day one, Hsoub Ads was developed with simplicity and ease of use in mind, and we will keep it that way. Creating a new Adunit, Ad Place or adding a website is just a single step. Excellent service. We are doing our best to provide excellent services to our clients, this includes suggestions to let them get the most of their advertising campaigns, helping publishers setting up the Ad Place code in their website.. etc. Focused on MENA. As entrepreneurs and publishers, we know the challenges faced by other entrepreneurs and startups in MENA. Mostly related to payments. That’s why we added some features to the system such as allowing clients to transfer credit to each other, supporting more payment methods… etc.